Educators all agree READING is the most valuable tool we can teach our children. 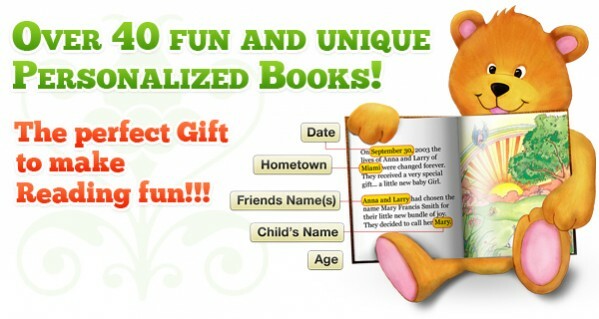 Create-A-Book personalized storybooks make a perfect gift, for birthdays, holidays or just because. Books educate, inspire imagination and build self esteem. Our personalized books will become cherished keepsakes and saved forever by your children. The children you love will be thrilled to see their own name in these stories. personalized books make your child the "STAR" of every story. Each of these wonderful stories includes a child's name, hometown, friends and family in every story. Whether your child is in sports or loves dinosaurs, each book teaches principles and values. They will enjoy this great keepsake for years to come. Our personalized baby books are a true keepsake recording the birth experience of your child in a storybook format, which will be cherished by children, parents and grandparents for years to come! Each baby book includes the date, time, Dr.'s name, hospital, baby's height and weight along with names of baby's first visitors.